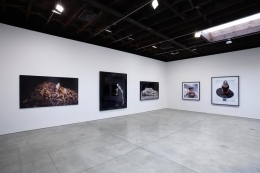 Sean Kelly Gallery is delighted to announce an exhibition of work by Marina Abramović – Personal Archaeology. The exhibition opens to the public on Saturday, May 8th at 10:00am. There is no opening reception. Personal Archaeology is an intimate look into the development of Abramović as a seminal artist, beginning with her historic performance work of the 1970's through to her most recent work from 2010. Private Archaeology, the sculpture exhibited in the first gallery, has not been shown before in the US. This highly personal work from 1997-99 consists of a large wooden cabinet containing numerous drawers in which artifacts from Abramović's life are displayed. 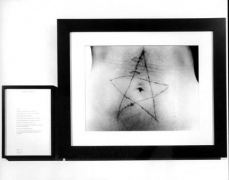 The public is encouraged to look through the drawers to view the variety of revealing objects and mementos that Abramović has collected, including photographs, handwritten notes and other material that has influenced her work. The exhibition also includes an entire gallery dedicated to photographs from one of Abramović's earliest performances – Rhythm 10 – in which she stabbed a knife between her splayed fingers in rapid motion, changing the knife each time she cut her finger. She repeated this process twice, tape recording it on the first occasion so that she could mimic the movements on the second. 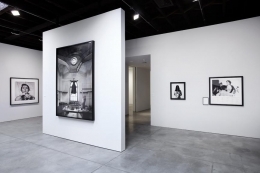 A selection of Abramović's iconic photographs is installed in the main gallery, providing a visual time line of the evolution of this pioneering performance artist. Works such as Rhythm O, Lips of Thomas, Carrying the Skeleton and Cleaning the House chart the trajectory of her career over the last 40-plus years. The main gallery also includes one of her newest videos, which is a startling image of Abramović, her face covered in gold leaf, staring out at the viewer. The faint ruffling of the gold leaf is the only motion in the video and draws the viewer in close for further inspection, whereby they ultimately find themselves meeting Abramović's direct gaze. 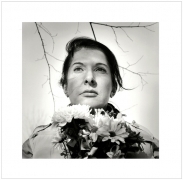 Marina Abramović, born in 1946 in Belgrade, Yugoslavia, is without question one of the most important artists of our time. 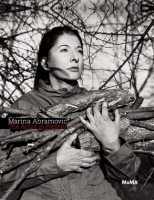 She was awarded the Golden Lion for Best Artist at the 1997 Venice Biennale for her extraordinary video installation/performance piece Balkan Baroque. Her work is included in many major public collections worldwide including: The Museum of Modern Art, New York; The Solomon R. Guggenheim Museum, New York; the Musée National d'Art Moderne, Centre Georges Pompidou, Paris, France; the Stedelijk Museum, Amsterdam, Holland; the Van AbbeMuseum, Eindhoven, Holland; the San Francisco Museum of Modern Art; and the Tate Modern, London. 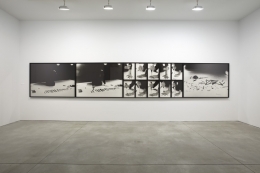 Notable solo exhibitions have included: Seven Easy Pieces, The Solomon R. Guggenheim Museum, New York; The Star, Contemporary Art Museum, Kumamoto, Japan; Marina Abramović: The Hero, Hirshhorn Museum and Sculpture Garden, Washington, DC; Marking the Territory, The Irish Museum of Modern Art, Dublin, Ireland, and Public Body – Artist Body, The Kunstverein Hannover, Germany. 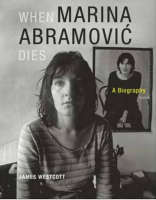 James Wescott's extensive biography on Abramović, When Marina Abramović Dies, has recently been published by MIT Press and Babette Mangolte's documentary of Seven Easy Pieces has just been released on dvd. Personal Archaeology will run concurrently with the major MoMA exhibition, Marina Abramović: The Artist Is Present, on view at the museum through May 31st. During the MoMA's first-ever retrospective of a performance artist, Abramović will perform daily during the entire run of the exhibition, for a total of over 700 hours, in her longest solo piece to date. Abramović sits in silence in the museum's atrium during public hours, inviting visitors to take the seat across from her for as long as they choose within the time frame of the museum's hours of operation. The exhibition is accompanied by a catalogue of the same name.